Hello dears! Happy Friday! I can't believe November is already gone! Isn't it crazy how fast times seems to fly? By the time you read this we'll be in our new home, struggling to get phone, tv, and internet connection so I thought it was simpler if I scheduled this post in advance. I'd be so looking forward to the weekend and enjoying our new cosy home! Off topic: A home of our own! Hello my dears! Today is a very special day, because we (my husband, my baby and I) have just moved in our new apartment, and we are so excited about it that is right now the centre of our lives. So, I thought to share with you this excitement, and joy. Hello my dears, how are you doing? How have you started your week? If you've been reading lately you'd know by now I'm moving to a new home. I couldn't resist to do a "Home Sweet Home" nail art, since the name of Essence's latest limited edition collection is so appropriate to the recent events my family is going through. And of course, I couldn't resist to share it with you! (Though, technically, I don't have the time to be blogging :P) Continue reading after the jump! Hi everyone! I have a quick post today. This is a great colour that came out with the OPI Swiss Collection for Fall 2010. This was my favourite colour of the collection, and still is. I think is so appropriate for Fall! I love, love (love) it. Have you got this colour? Do you love it as much as I do? NOTD: OPI Nein! Nein! Nein! OK Fine! Hello my lovelies! How are you doing today? Today is a very special day, because is my hubby's birthday. I'm planning to do some nice surprises for him (all food related, lol) because he loves home made pizza and it's been long time I haven't made it. I've been also baking mini cakes gingerbread-men shaped because I got a new baking form I have to try, and It seem only right to do some treats for my sweet tooth darling in his day. If they ever come out acceptable, I might post a pic or two. I've also got him a present which is a surprise for our new home, so I'm not saying anything, because he reads my posts from time to time. This post is beeing scheduled in advance, so by the time you read this, our bellies will have prbably be already full with pizza and cake! lol. Hello my dears! How is your week so far? I've spotted the Home Sweet Home collection from Essence a the very end of October, and wasn't very much intrigued by it. The lippies and the clear lipgloss weren't calling my name, and the eyeshadows looked too warm for me. But I think that was the idea, a warm and cosy collection, like being at home. However, I can hardly say no to a nice blush, and even less to nail polish! I'll show you the swatches in a separate post very soon! You can check the whole collection here. 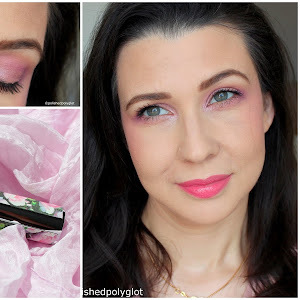 The blushes of this collection have two shades in one, and I appreciate a lot blushes like this, because you get more versatility for varing your looks. The one I pick is called 01 Knit for chicks, and is a light rather cold shade of pink combined to a dark mauvey pink. I really like dark blush colours for blushing, for a more dramatic look. They just have to be the right shade. In this case I think this shade plays well with my skin. I was curious to try some "gel like" nail stickers and I thought these were a good option to start, because they're not very expensive. These are named 01 Neither Swedish Nor-wegian and are supposed to reproduce a classical Scandinavian knitted pattern. Well, I'll tell you, but you can see for yourselves, these stickers are meant for rather short nails, plus they aren't very wide either. I have really small nails and these won't cover the whole width of them. And that's why they're inexpensive. I find useful the fact that these come with instructions, though. And last but not least, I had to pick the cute knitted pouch!! That also has a name and is 01 Knitted with love. Isn't that cute? What do you think about this collection? Any particular item you've picked already? Any favourites? I'm now very impatient to swatch the polishes I've picked, so stay tuned for the rest! Hello dears! How are you starting the week? I've tried to reproduce the nails the model was wearing for the Catrice SpectaculART Collection. 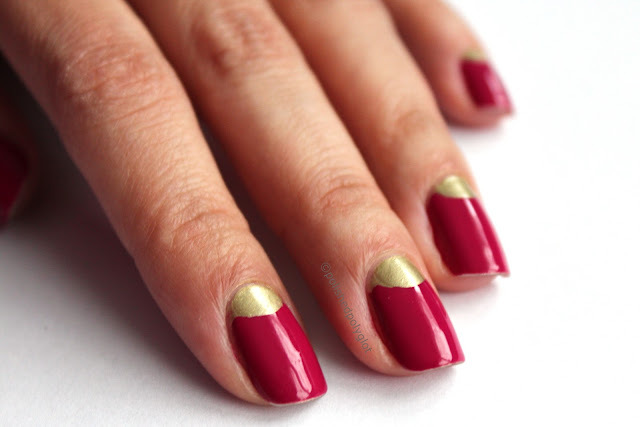 For this manicure I have used Catrice Shanghai (gold) from the LE Big City Life collection, and Revel the Red from the SpectaculART collection. The picture above does not show the true colour , I've taken that one under dimmed natural light. Hello dears! How's been your weekend so far? Mine has been busy as usual lately, so me and my husband are looking forward to our vacation in Argentina to have a real rest! Today I'm bringing you a great shade that was was part of the OPI Burlesque Collection for Holiday 2010, OPI Rising Star. I remember back then, with all the other amazing shades of the collection, this colour was a little put aside in the reviews. I only got 3 colours from this collection, and wore this one many more times than I wear any polish in average. I'm really attacted to warmer shades as they seem to complement my skin tone much more than cooler shades. there are a few exceptions, but that's the general rule. What I love about this colour, besides the shade is the finish. This is for me the closest to authentic foil I own, since there are massive sparkles reflections with minimal brush strokes. What are your thoughts about this one? Is there any "oldie" golden shade that you really love in your stash? Hello dear readers! How are you enjoying your weekend? Today, I bring to you the third episode of The Battle Challenge, which is again a colour battle Pink vs. Purple. Ok, I must say this one was a difficult one, because I love both colours very much, and couldn't make up my mind in which shades to use. I went with one of my untried pinks. Happy Friday my dears! which are your plans for the weekend? Anything interesting or exciting? Not much excitement here, except we will be moving in less than two weeks! I'm impatient to be in the new apartment, because all is brand new, and bigger than the old one, but at the same time there's still so much to be done! After moving, we'll only stay few days in the new home and then we'll be taking off to Argentina!!!!!!!!!! I'm so excited and looking forward to it, not only because is summer there, and we spend always great holidays in my home country, but also, and specially, because we will introduce our baby to the whole family, including my brother and my grandparents! My parents and my sister have already met our child, because they came to Switzerland for his birth and Baptism. And I'm also so excited I'll meet my nephew in person. I'm an aunty! but have not been in Argentina yet since he was born. Well, enough of chattering, into the polish! 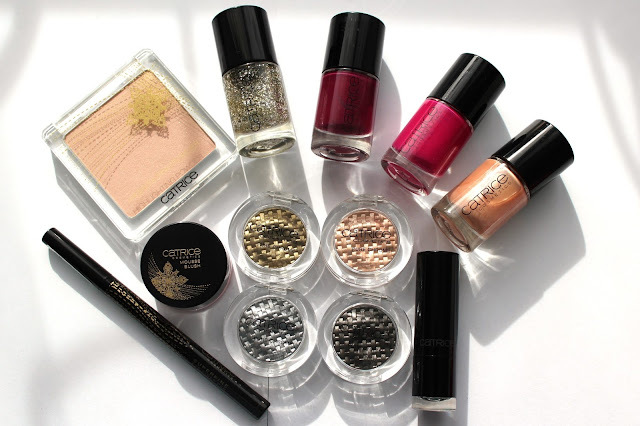 Today I have for you the rest of the Catrice LE SpectaculART, meaning the polishes. This collection includes 4 shades of which I've picked 3, and the glittery top coat. To see the other items I've picked click here. Hello my Dears! We arrive gently to the end of the week, just one more day to go, and I'm going to be honest with you, all you've been reading in my blog this week has been written and scheduled during the past weekend! Yep, I'm an organized person (hey! I've worked many years as high level manager asisstant ;) so I kind of can't help it lol! The truth is I already knew this week was going to be more than busy, chaotic, and I have so many things to share with you NOW! 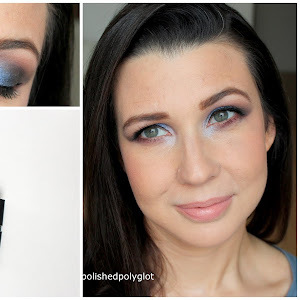 I didn't want to miss the opportunity to show you the make up swatches and everything. In fact, my baby is starting to attend the crèche and there's two weeks of "adaptation period", then day, after day I have to take him for one hour, then two, and so on, until he stays the whole day. These gorgeous shade of blue has been worn by me the earlier this week, and I've actually used it as a base for some nail art! 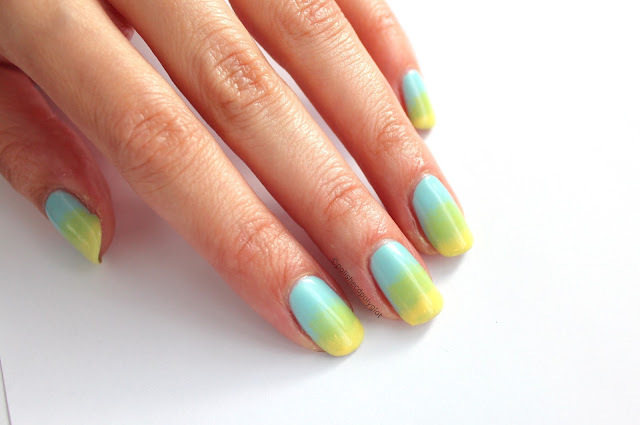 So it's not truly a manicure of today's, but still a great colour! Let me know what you think! Isn't this colour very appropriate for this time of the year? Recent shopping: NYX & China Glaze glitter polish! Hello everyone! How are you doing? I wanted to share with you one of my recent hauls. The picture above was taken when I received the order from Cherry Culture, placed while they were having China Glaze 20%. The best China Glaze weren't part of the sale, only older collections, so I only picked three oldies but goodies (picture below). But as I'm in Switzerland shipping resulted a little expensive for only three polishes, and I decided to order some NYX Girl Glitters which retailed 2USD each. I remember trying to hold my breath not to scream when I opened this package because my little boy was sleeping, I was so happy to see all that glitter together my eyes didn't know where to look! I know, China Glaze Liquid Leather is the odd one out, but it was unacceptable for me not to own one single good black nail polish, so I picked this one. 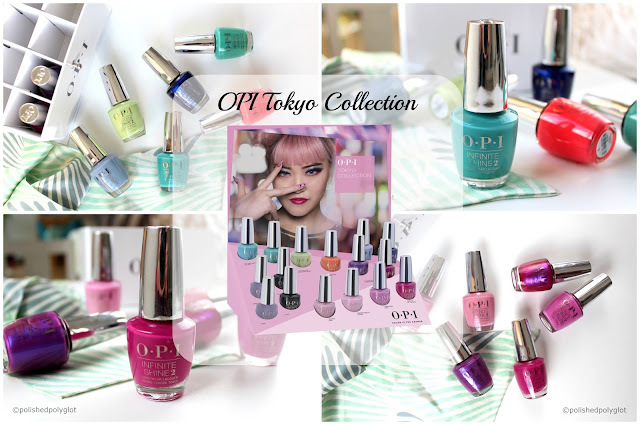 I have many ideas for manicures using these, and If you want me to swatch any in particular please say so in the comments. 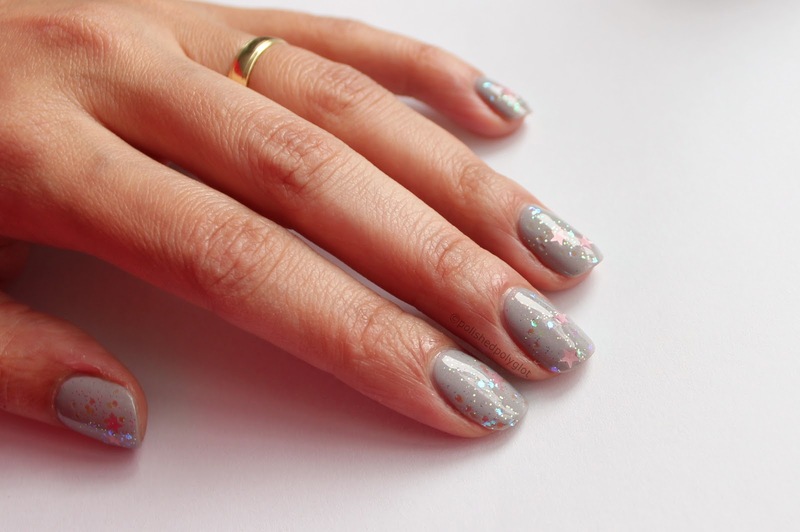 So, do you like glitter nail polish? Which are your favourites? Do you own any of the pictured above? Hello Everyone! How are you doing today? Hello my dears! How has your week started? Mine started a little stressful with so much to be done, but I had a wonderful weekend with my family and friends, one of our friends turned 40, so we had a lovely birthday party for her, all in all I can't complain. Today I'm bringing you the second "Battle" of this challenge which is a colour battle Black vs. White. 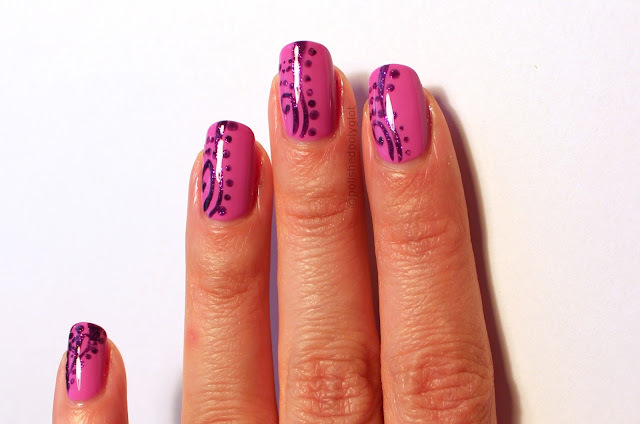 This post should be one of those "How to...", in fact it should be "How to ruin your manicure in one simple step", and the answer would be even shorter: Just let Natalia do her stamping. Hello my dears, enjoying the weekend until the very last second? You should! Today I have for you a beloved colour of mine, Chanel 491 Rose Confidentiel. Please, trust me, this is not your grandma's rose! I absolutely adore this shade, which applies like a creme and has a gorgeous glossy jelly-ish finish. It's been long time since I last wore this shade and I was "missing" it. What are your thoughts? Rare beauty or meh?